For more than three decades, the New York Giants have been one of the most competitive teams in the National Football League, winning four Super Bowls and eight conference championships in that time. Now, Lawrence Taylor—Hall of Fame player and consummate Giant—teams up with William Wyatt to tell the stories of the Giants' most memorable players and coaches, including Bill Parcells, Rays Perkins, Carl Banks, Harry Carson, and Gary Reasons to name but a few. In My Giant Life, Taylor looks back at the best games, best moments, and behind-the-scenes stories of the men who played and coached for the team. Lawrence Taylor is a Hall of Fame linebacker who spent 13 seasons, his entire professional career, with the New York Giants. He was second in all-time career sacks at his retirement, was the NFL Defensive Player of the Year three times, and earned 10 Pro Bowls. He lives near Miami, Florida. William Wyatt is a freelance writer whose works have appeared in numerous sports and business publications. Lawrence Taylor is one of the best to have played the game. He redefined what it meant to be a linebacker in the NFL. As an NFL league MVP, three-time Defensive Player of the Year, two-time Super Bowl winner and a Hall of Fame inductee, it’s clear that he constantly impacted the game, and there isn’t much else that could be asked from a player. Wyatt reflects on the New York Giants after Lawrence Taylor, including looks at Tom Coughlin, Eli Manning and Odell Beckham Jr. In My Giant Life, Taylor looks back at the best games, best moments and behind-the-scenes stories of the men who played and coached for the team. For more than three decades, the New York Giants have been one of the most competitive teams in the National Football League, winning four Super Bowls and eight conference championships during that time. 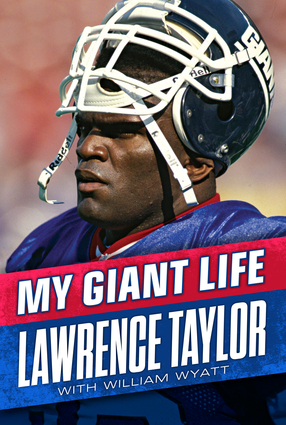 In My Giant Life, Lawrence Taylor unapologetically lays out his love of the game and explains why he’s a Giant for life. Lawrence Taylor is a Hall of Fame linebacker who spent 13 seasons, his entire professional career, with the New York Giants. He was second in all-time career sacks at his retirement, was the NFL Defensive Player of the Year three times, and earned 10 Pro Bowls. He lives near Miami, Florida. William Wyatt is a freelance writer whose works have appeared in numerous sports and business publications.